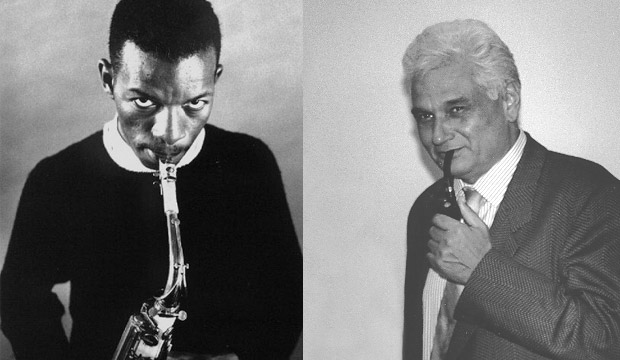 Jacques Derrida interviews Ornette Coleman / "Sound has a much more democratic relationship to information"
A conversation between French philosopher Jacques Derrida and jazz musician Ornette Coleman, this interview has some echoes of the Esperanza Spaulding conversation, particularly both Spaulding's and Coleman's perception of the relationship between music and voice/language. "So the comparison between bass and voice I think would be that the melodies that I’m playing on bass, for most listeners, are much more abstract than what I’m singing. We have such an ingrained connection with the human voice, that however I open my mouth and sing, it’s going to have some symbolism or meaning for the listener -- because it’s a voice. The way I breathe, the way I enunciate, even if I’m not singing lyrics, and then when you add lyrics -- okay, so then it’s not abstract at all. I’m actually telling you what I’m talking about, what I’m emoting about. So with the bass, there’s a certain freedom in the abstraction." "I'm trying to express a concept according to which you can translate one thing into another. I think that sound has a much more democratic relationship to information, because you don't need the alphabet to understand music." Jacques Derrida: "The very concept of improvisation verges upon reading, since what we often understand by improvisation is the creation of something new, yet something which doesn't exclude the pre-written framework that makes it possible." Ornette Coleman: "...the idea is that two or three people can have a conversation with sounds, without trying to dominate it or lead it. What I mean is that you have to be .. . intelligent, I suppose that's the word. In improvised music I think the musicians are trying to reassemble an emotional or intellectual puzzle, in any case a puzzle in which the instruments give the tone. It's primarily the piano that has served at all times as the framework in music, but it's no longer indispensable and, in fact, the commercial aspect of music is very uncertain. Commercial music is not necessarily more accessible, but it is limited." Ornette Coleman: "If you're playing music that you've already recorded, most musicians think that you're hiring them to keep that music alive. And most musicians don't have as much enthusiasm when they have to play the same things every time. So I prefer to write music that they've never played before..."
"I want to stimulate them instead of asking them simply to accompany me in front of the public. But I find that it's very difficult to do, because the jazz musician is probably the only person for whom the composer is not a very interesting individual, in the sense that he prefers to destroy what the composer writes or says." Ornette Coleman: "I don't know if it's true for language, but in jazz you can take a very old piece and do another version of it. What's exciting is the memory that you bring to the present. What you're talking about, the form that metamorphoses into other forms, I think it's something healthy, but very rare." Ornette Coleman: Do you ever ask yourself if the language that you speak now interferes with your actual thoughts? Can a language of origin influence your thoughts?